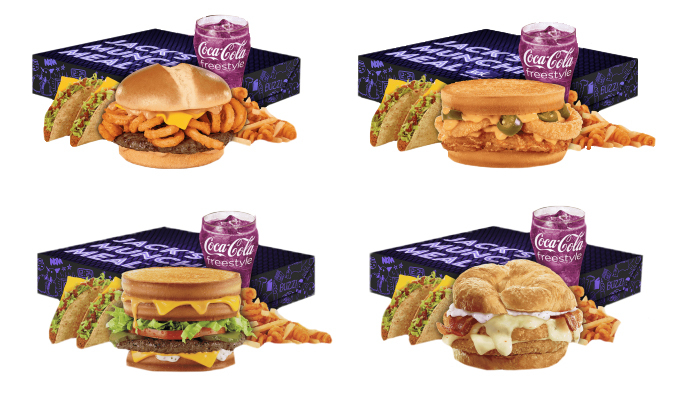 Jack in the Box has always had a college like humor in their advertising and that is certainly displayed with their Munchie Meal promotion. A Munchie Meal consists of a main sandwich or entree, two tacos, a mixture of regular and curly fries, and a medium drink. This is targeted towards the late night, student type of crowd and usually has a special price past 9 PM, though it is available all day long. No Jack in the Box coupons are needed for this deal. If you’re a fan of one type of the fries, you can ask for them to be all regular fries or curly fries. There are currently 4 types of main sandwich for the Munchie Meal. These aren’t your regular burgers or sandwiches and they are a bit outside of the box (ha, get it?). The 4 current burgers and sandwiches available are the Siracha Curly Fry Burger, the Spicy Nacho Chicken Sandwich, the Stacked Grilled Cheese Burger, and the Chick-N-Tater Melt. These are all a tasty option after a long night of partying or being locked to the couch playing video games.